Ole Gunnar Solskjaer was offered a statue in this brilliant interview by former Manchester United team-mate Gary Neville after the win over Paris Saint-Germain. The Norwegian tactician pulled off one of the most memorable results in United’s recent history with a stunning 3-1 win at the Parc des Princes on Wednesday night. What have you just done ! ? 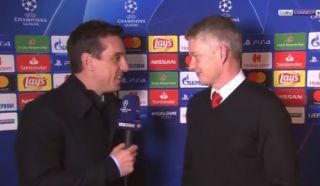 It’s fair to say Neville looked absolutely buzzing afterwards as he chatted with Solskjaer, who must surely now be the leading contender to get the manager’s job permanently. Neville clearly thinks United need to go one further than that and also build him a statue for this memorable result.